The team celebrated the 6 God at tonight’s home matchup against the Warriors. The Toronto Raptors held their third annual Drake Night for their Wednesday night home game against the Warriors, honoring their global ambassador and most famous fan. Drake led off the night with a pregame press conference, fielding questions on the event, and even weighing in on the Dubs and the Kevin Durant move. Drake also confessed his love for NBA on ESPN analyst Doris Burke, by wearing a T-shirt with her face on it, reading "Woman Crush Everyday." The celebration also included a complimentary commemorative tee for fans, which pairs The Raptors logo with Drizzy's 6 God prayer hands. 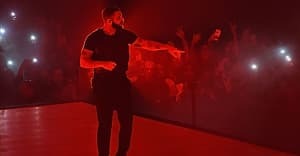 At halftime, Drake joined 7-year-old viral sensation Young Dylan on court, who made it all the way to Ellen last month to perform his take on Drizzy and Khaled's "For Free." Also, some basketball was played, with the Warriors pulling out a 127-121 win over the Raps. Peep some Twitter-sourced highlights from the night below.